KIEV, Ukraine -- Two soldiers, a pro-Russian rebel and a civilian were killed in 24 hours of fighting in eastern Ukraine, the Ukrainian military and rebels said separately on Sunday. 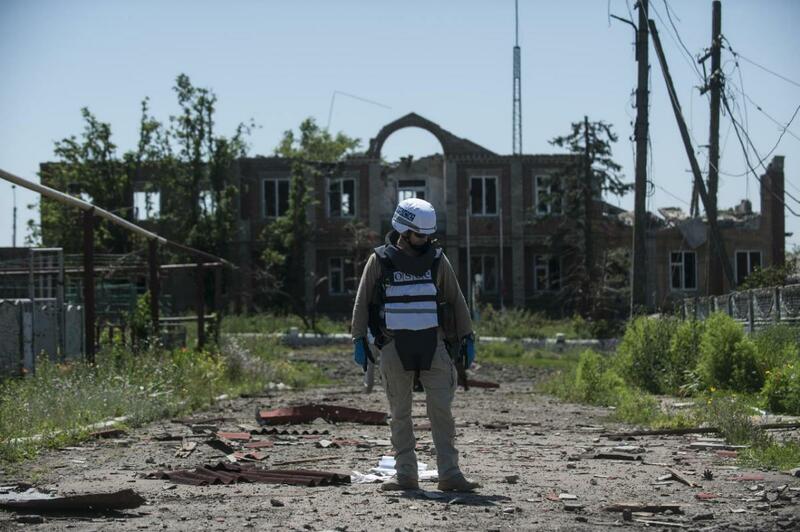 An OSCE monitor checks the territory for mines during a patrol in Shyrokyne, Donetsk region eastern Ukraine, Saturday, July 4, 2015. "We have lost two soldiers in fighting and acts of provocation, five have been wounded," Ukraine army spokesman Andriy Lysenko told journalists, reporting heavy shelling by rebels despite a four-month truce. Senior separatist figure Eduard Bassurin, meanwhile, said shots "fired by the Ukrainian army" killed a rebel and a civilian. Lysenko accused rebels of using "on 10 occasions artillery over 100 mm calibre." Such heavy weaponry was to have been withdrawn from the frontline under the terms of a peace deal signed in Minsk. The military spokesman said firing came from the area around Donetsk airport, controlled by pro-Moscow rebels since January but still a flashpoint, as well as close to the village of Trokhizbenka in the rebels' self-proclaimed people's republic of Luhansk. Also Sunday, Ukrainian President Petro Poroshenko charged that a "record number" of Russian troops were deployed at the border with Ukraine, without giving a precise figure. "According to our information, a record number of Russian troops are deployed along the border with Ukraine," Poroshenko told Ukrainian television. "These reports from our intelligence services have been confirmed by NATO, the United States and the European Union." He added that the Ukrainian army, which has deployed some 64,000 soldiers in the conflict zone as well as interior ministry forces, was prepared to "defend Ukraine". 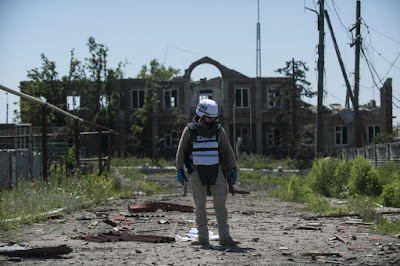 In a report published late Saturday, the Organisation for Security and Cooperation in Europe (OSCE), which has a monitoring mission in eastern Ukraine, said it had observed 617 ceasefire violations "at and around" Donetsk airport. More than 6,600 people, most of them civilians, have been killed in the conflict, which began in April 2014. Moscow denies either instigating the uprising or providing the militias with heavy weapons and tacit support from Russian troops. But it offers the separatists strong diplomatic backing at both the United Nations and the periodic Minsk truce talks.